So revolutionary and popular were miniskirts in the 1960′s that a plethora of accessories were made for them. This “Original Mini- Skirt Accessory” is easily one of the more insane ones. 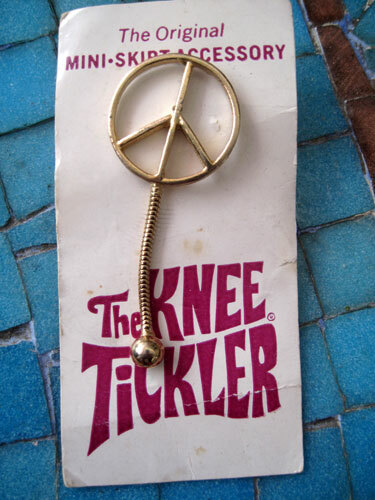 I guess the object was to remind you you were wearing a miniskirt when, clipped to the hem line, the little ball swinging from the 1-1/2″ long chain bounced or tick-tocked against your knee with each step. Because I spend about 80% of my day squinting at screens of various sizes and working by the glare of them at night, eyeglasses have been a permanent part of my face for years. This never bothered me as I view these artifacts as part of the self-expression arsenal, equal status if not more to any piece of clothing, shoe or hairstyle used to distinguish oneself in the world. As a consequence, only having one pair of glasses never worked for me. 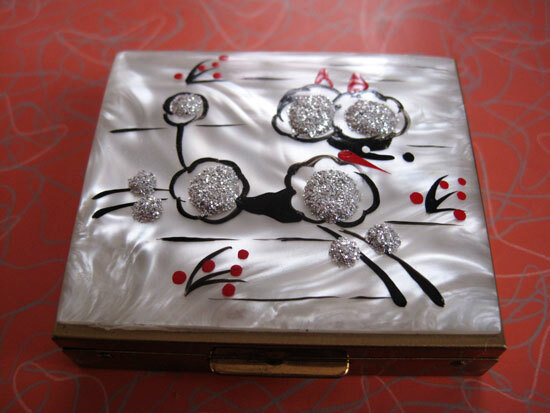 In the spirit of poodles this week, I may as well throw in this fantastically 50′s mother of pearl, sparkle bumped, handpainted poodle compact. I’ve never had powder packed in it but I tote around a variety of small items in the mirror lined case. 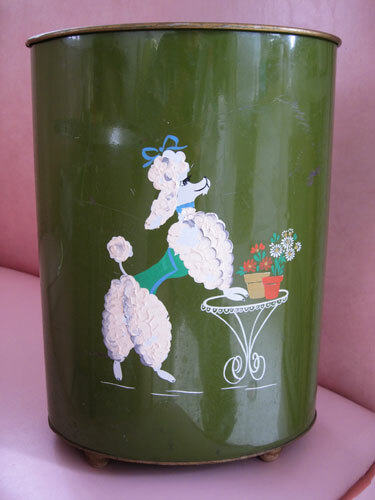 As I said yesterday, I’m not one to randomly collect poodles just because they’re an endearing and iconic symbol of the first totally modern decade to which I am ever beholden, the 1950′s. 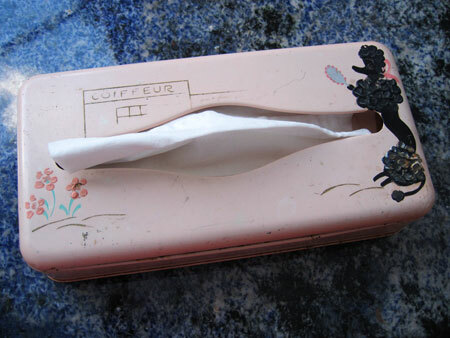 But it dawned on me as I adopted Fifi the wastebasket that she was a perfect mate for this Kleenex holder that’s been riding around in the back seat of my car forever, always there in my time of nasal need for at least the last decade. 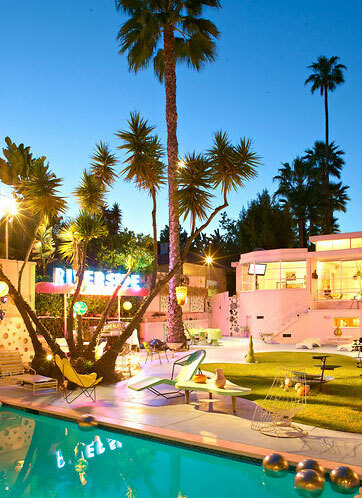 This past weekend LA was in bloom with garage sales. 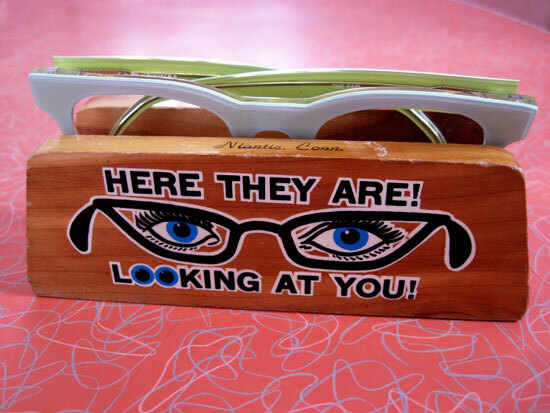 I’ve tried resisting these for years, especially since opening The Allee Willis Museum Of Kitsch at AWMOK.com, as not only do I have the thousands of items in my own kitsch collection to store but these days I’m the happy recipient of at least a few boxes a month that arrive stashed full of other peoples’ kitsch. 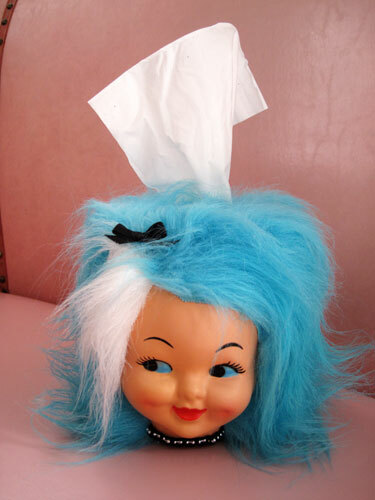 But I was tooling down Fountain Ave. and there she was staring at me, the classic bathroom or teenagers room accessory icon of the 1950s, lovely Fifi. Allergy season is in FULL TILT here in LA. I never had allergies before but for the past few days my eyes have been wetter than the Mississippi and my nose is flowing like Niagara Falls. The only thing that makes me feel better is that I can reach into this lovely lady’s head to grab a Kleenex every time the river starts to run. I’m not a lover of dentists. Though I have one I do love now in LA, Dr. James Formaker, I’m still feeling repercussions from a butcher in Beverly Hills who not only put me through two unnecessary surgeries, one of which he didn’t even have conscience enough to check to see if the surgeon had preformed the correct one of – which he hadn’t – and all of which cost me over $25,000 and an even more severe price of walking around with a sore mouth for the last four years. His name is happily provided upon inquiry. 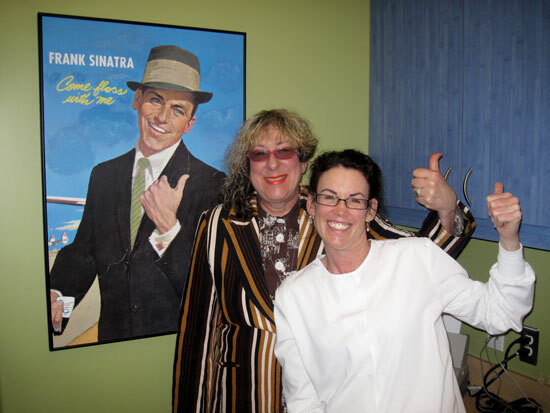 But I had a tooth adventure during my trip to Detroit a few weeks ago that completely restored my faith in these people who dutifully drill in your mouth in search of decay. 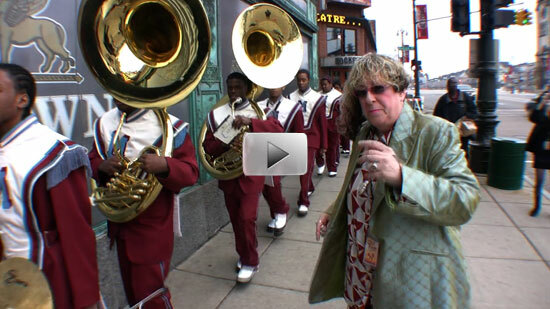 As I’ve been blabbing about for weeks now, I had the extreme pleasure of conducting my high school marching band playing a medley of some of my greatest hits in the lobby of the theater I grew up in in Detroit with the cast of the musical I co-wrote, The Color Purple, singing along. I meant to post video of our performance as soon as I got home but to my horror, one of the three cameramen only shot the students from the back and the other both forgot to turn his camera on for parts of songs and babbled over the footage like he was the subject of a documentary. So it took quite a lot of editing to get something where you could even begin to see the warm, wonderful and uplifting-higher-than-the-sky feeling that permeated the theater that day. 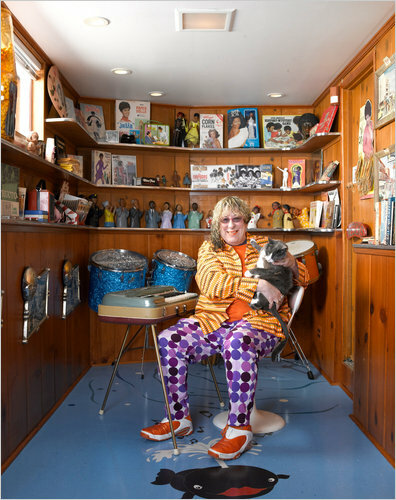 Allee Willis’ Kitsch O’ The Day – Happy Mother’s Day! 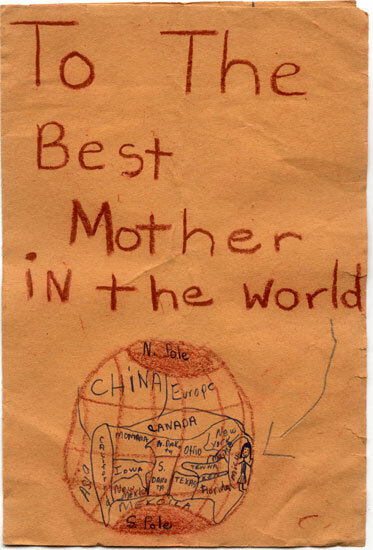 Mother’s Day has always provided supreme opportunities for kitsch. Be it flower arrangements, stuffed animal displays in front of gas stations for last minute pick-ups, or greeting cards – store bought and handmade equally qualifying – Mother’s Day is a kitsch karousel that never ceases to go round.